That’s actually a house (or was meant to be). I seem to recall that many years ago Popular Science or Popular Mechanics had an article and maybe even building plans for these. 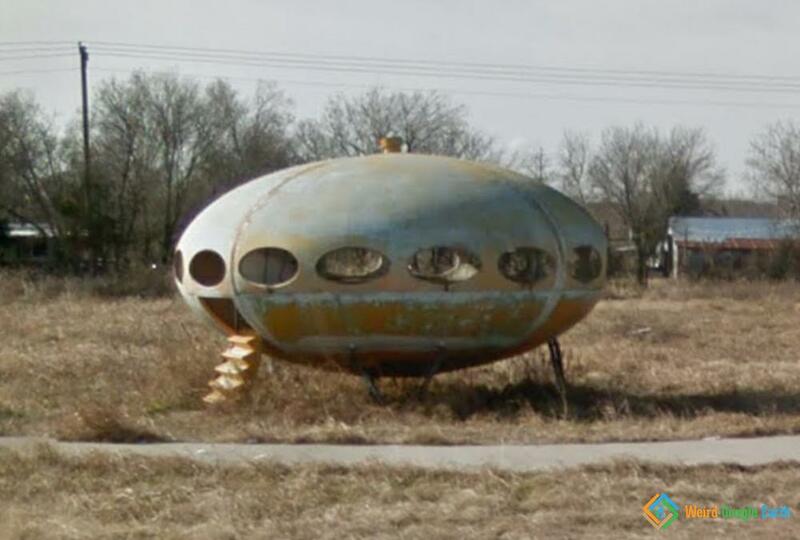 I drive by this saucer when I’m in Texas, its between Rockwall and Quinlan. I stopped and went inside about 14 years ago. At that time it still had most of its windows.I heard it used to be an office for a used car lot. About seven years ago someone replaced all the bubble windows and it was supposed to become a hair salon, but it never happened. After that it got vandalized and this is a recent photo. Its a shame because its still a reasonably sound fiberglass structure. I wish I could afford to make an offer on it and move it to my land, it really deserves to be restored. The steps fold up like a drawbridge and there used to be a door, one round room and a small bathroom. I think a fair number of these were manufactured in the 70s. ITS RESTORED!! check it out using the coordinates on google maps and you will see that its painted bright orange and looks MUCH better.